Work is under way this spring to fill a major gap in what supporters hope will one day become a 46-mile bicycling and walking trail through Columbia and Dutchess counties. The eight-mile section now under construction will connect two existing sections of the Harlem Valley Rail Trail, resulting in a trail of 23 continuous miles from Copake south to Wassaic, the northern terminal of Metro North Railroad’s commuter line to New York City. Two sections of the overall trail route that are already open to the public include 10 miles north from Wassaic to the center of Millerton and another 4 miles from Under Mountain Road in Ancram to Orphan Farm Road in Copake. The new section will close the gap from Under Mountain Road to Main Street in Millerton. This section is expected to be completed and open to the public by the fall of 2020. The result will be a great recreational resource for people who live in the region, and it will also add to the area’s appeal for visitors, she said. “People will be able to take the train with their bicycles from New York City to Wassaic, and then use the trail all the way up to the northern end,” DeLeeuw said. Trail users from Millerton and south will now have direct access to the Taconic State Park and other recreational attractions in the Copake area, she added. 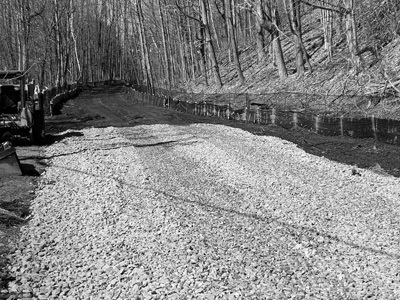 The idea of creating the Harlem Valley Rail Trail was first proposed nearly four decades ago, after the Penn Central Railroad tore up its 46-mile line from Wassaic to Chatham. But turning that dream into reality has been a long and arduous process. The Harlem Valley Rail Trail Association was founded in 1986 and incorporated in 1996 to support the project. The association has worked collaboratively with local, state and federal governments, area organizations and individual supporters. The trail route is now owned by the state Office of Parks, Recreation and Historic Preservation. Work on the new 8-mile section, which began in March, is projected to cost $14.7 million, of which federal funds will cover nearly $9.4 million. In October, the Dutchess County Legislature approved funding for its share of the work, and Columbia County and the state parks agency are providing additional funds. The new section involves construction of about 4,100 feet of elevated boardwalks through environmentally sensitive areas as well as the rehabilitation of former railroad bridges that were deemed structurally deficient. In Dutchess County, the trail project is among several parks and recreation initiatives that County Executive Marcus Molinaro touted earlier this year in his State of the County address. Other projects include the acquisition of more than 230 acres in East Fishkill for the future Lake Walton Preserve and a study to explore the feasibility of a pedestrian and bicycle trail and trolley operation along an unused railroad line in Beacon and Fishkill. The route from Wassaic to Chatham was built in 1852 by the New York & Harlem Railroad, which ultimately became part of the Penn Central. Passenger trains from Chatham to New York City made their final runs over the route in 1972, and the tracks were removed by 1980. Supporters hope eventually to complete an uninterrupted cycling and walking trail along the entire 46-mile route of the former railroad line. The right-of-way extends north from Wassaic to Copake and Hillsdale, and then veers west and north through Craryville, Philmont and Ghent to Chatham. Along the way, it passes through varied and scenic countryside, including open fields, forests, wetlands and town centers. The trail serves residents and tourists who use it for short walks or bike rides as well as for longer trips. The first portion of the trail opened in 1996, and other segments along the Route 22 corridor have been added in phases. Planning and construction of individual sections are undertaken as they are ready, while preparations are being made for other sections. There are many steps that must be undertaken before construction can start on each section, including organizing community and government support and acquiring the abandoned track bed and surrounding land from willing sellers. The preparations also involve raising money, developing designs and plans, and addressing environmental impacts and the concerns of neighbors. Federal funds for the section that is now under construction were already allocated, but the project was delayed for many years by a tangle of financial, physical and legal issues. The new portion goes through an environmentally sensitive area that includes wetlands and the habitat of endangered species. This required complex engineering and design to adhere to environmental regulations. In addition to the boardwalk construction and the rehabilitation of bridges, the project involves construction of new trail crossings at intersections with Main Street, Beilke-State Line Road, Rudd Pond Road, White House Crossing Road and Under Mountain Road. The project’s design team worked closely with multiple partners, including the state Department of Environmental Conservation, the U.S. Fish and Wildlife Service, and the U.S. Army Corps of Engineers. With the new section under construction, a related priority is to connect two sections near the border of Copake and Hillsdale, DeLeeuw said. The main northern trailhead is at Orphan Farm Road in Copake, but there is another completed section of about 1.5 miles to the north of that in Hillsdale. She said a design for the bridge has been completed, but it will still need funding and permits before it can proceed. Meanwhile, planning and preparation for the sections between Hillsdale and Chatham is also proceeding. DeLeeuw said draft designs have drawn up, and much of the property along the route has been acquired or rights have been granted. “It will require time and a lot of work, but we’re continuing to make progress,” she said. Although it has been a long and challenging process, DeLeeuw said the trail’s supporters remain enthusiastic.